Create ready packets of coffee or loose leaf tea by simply scooping the amount desired into one of the paper filters and the Perfect Pod machine will heat seal your pod. The kit includes forty sealable pod paper filters for single or double pod creation. 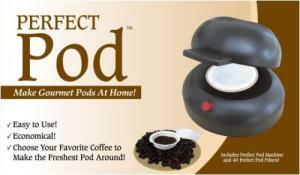 The pods work with any pod machine except the Tassimo or the Keurig. Refill sets of forty filters each are available. Perfect Pod has a number of tested recipes on their site and they make adapters for use where the Keurig K-cups are called for. Have you seen the price of pods? Outrageous. Create your own pods easily at home or the office with the Perfect Pod Maker. You choose the coffee, blend, or tea you'd like, add and seal. You are no longer limited by the types and choices offered in the expensive prepackaged pods. Use your own favorite coffee flavor or brand. Create fresh pods whenever you want one or make several at once and store them for later use. You retain the convenience of pod filters without the cost, without waiting for shipment. One of the biggest complaints about single cup and pod version coffeemakers is weak coffee. Perfect pod offers a low tech solution. Want a slightly stronger brew? Add additional grounds to the pod. People have found this unit super fast and straightforward, requiring mere seconds to make a pod. Definitely a hit. Also see the Bosch Tassimo coffeemaker.